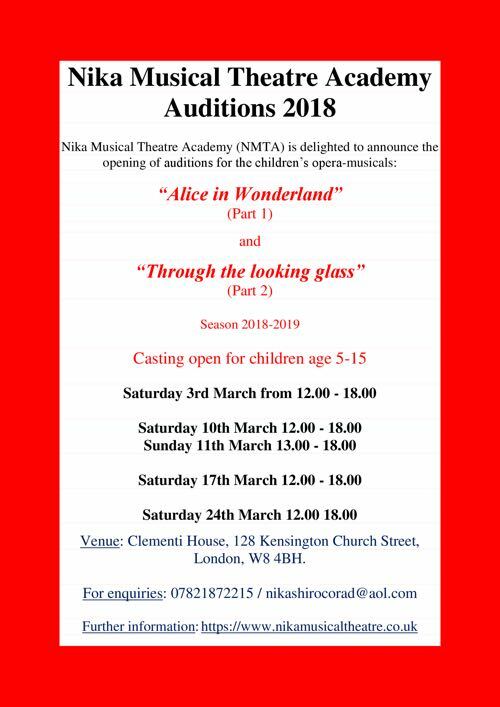 The Nika Musical Theatre Academy (NMTA) is pleased to announce the opening of casting for places in the 2018 youth opera-musicals based on 2 well known fairy tales: Through the Looking Glass by Lewis Carrol and Three Pigs by Joseph Jacobs. This is a great opportunity for children of all ages to experience the wonders of musical theatre! As you've previously shown some interest in our productions we are writing to invite you to arrange an audition for your son/daughter to join us and take part in our forthcoming productions. Singing and violin are also held during January and February. Clementi house 128 Kensington Church Street, W8 4BH. MUSICAL THEATRE EASTER AND SUMMER. NMTA was founded in London in 2014 by Russian-born, British classical pianist and composer Nika Shirocorad. Having trained, taught and performed at top conservatoires in Moscow, Paris and London, Nika set out to pass on her passion for classical music to the next generation in a more accessible form. "Traditional conservatoire teaching is very academic, disciplined and takes a huge commitment over many years. I want to open up the wonderful benefits of this education, which I have experienced, to a wider generation of children via my second passion, which is Musical Theatre. The beauty of Musical Theatre is that it incorporates such a wide spectrum of the Arts, where classical and contemporary genres can be combined in an endlessly creative and fun way." The teaching is founded on a classical conservatoire education, made accessible, exciting and fun through modern performing arts. So students simultaneously learn classical skills and knowledge whilst immersing themselves in the world of musical theatre and performing in stage-productions with top classically-trained professionals. The colourful world of theatre, combining classical and modern genres of singing, dancing, and acting, engages young students to actively learn classical artistic disciplines. These include classical and modern singing techniques, world music history, music theory, harmony, rhythmics, and even artistic classical literature, which are integrated within the teaching in a playful and creative way. This form of active, tension-free learning facilitates a natural passion and interest for students whilst providing a grounding in a wide spectrum of arts-based disciplines. NMTA offers a mixture of individual and group tuition, which enables each student to benefit from individually-tailored lessons to focus on improving specific areas, as well as the opportunity to develop and learn within a small group of 3-6 students. Students are encouraged to develop their own creativity of expression and style as they progress, using the classical skills they acquire to make a part 'their own'. Nika is a full and accredited member of the Musician's Union (MU), which also accredit her teaching method. Students gain access to a wide spectrum of disciplines at a high level, acquiring a sound basis should they wish to pursue a musical or any other performing arts-based training or further education in the future. Students develop self-confidence and self-expression, improving communication skills, so that they become imaginative performers with character, musicality and their own style. Students gain the rare experience of performing publicly with top professional performers. Discovery and exploration of their various talents. Learning how to collaborate and cooperate within a group for the benefit of the collective outcome, culminating in a theatre production. Opportunities to perform publicly in classical concerts. Music, lyrics and scripts are specially written (and copyrighted) by Nika for each show. 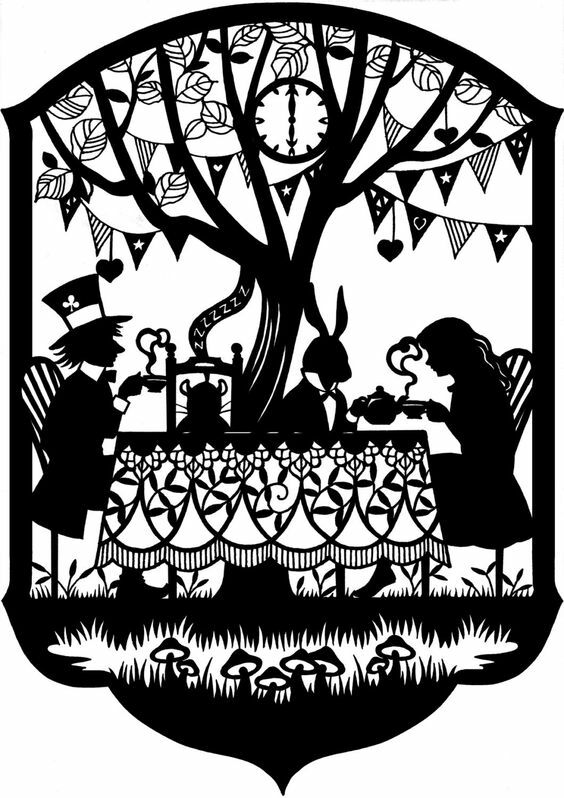 Artworks, decorations and all costumes are handmade and exclusive. Students are encouraged to have creative input to the development of each production. Professional theatre collaboration with Oxford House Theatre, London and Cockpit Theatre. Professional collaboration with the recording department of Huddersfield University. NMTA, Nika Young Talents Foundation Scholarship awarded as part of the audition/selection on the combined basis of merit and financial needs. ALL NMTA STUDENTS ARE ELIGIBLE TO ENTER LAMDA (London Academy of Music and Dramatic Arts) EXAMS. Please inform NMTA if you wish to prepare for LAMDA or RADA exams.